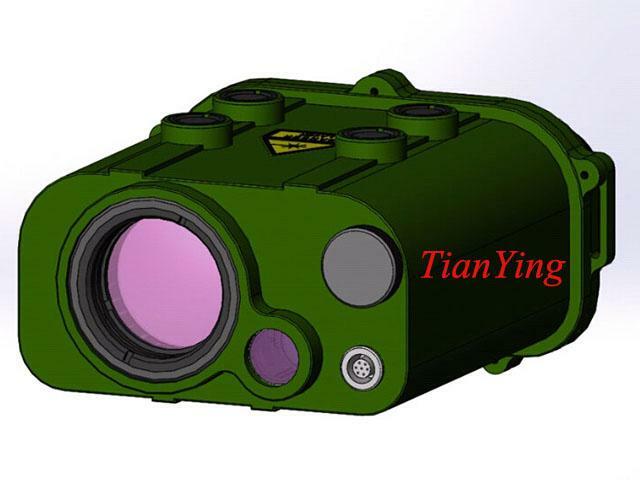 China TianYing TY-LR66 is the smallest military monocular laser rangefinder binoculars, enable acquisition of low reflection 5 square meters targets up to 5km, house up to 10km with 0.5m accuracy and 0.2Hz measuring rate. The monocular eye military laser rangefinder uses a Nd:Yag solid-state laser transmitter, that operates at a class 3 eye-safe wavelength of 1064nm. The LRF-10km can also be mounted on a tripod or Goniometer for stationary use. In combination with a Goniometer, which is equipped with a compass and an inclinometer, the LRF-10km becomes a system for determination of the own position and the target position. Option add thermal night vision function. 1. High resolution monocular eye telescope with digital display. 5. Store up to 10 measurements, which can be re-called unlimited at any time. 6. RS232 interface data output. 9. Combination with a night vision device possible. 10. Option add elevation function. Ranging capability 5km of 5 square meters vehicle/ship, 10km of mountain/building. Operating time with one battery More than 1000 ranging, more than 20 ranging after the low voltage indication appears (+25°C. ), the battery can work in -40 °C. Reliability(Laser life) ≥ 100,000 measurements. * - Note *- The 500m is from telescope' objective lens to measured target, within the 500m can not aim man's eye. **- The binoculars' operator is eye-safe. ***- Technical information is subject to change without notice.